Long hair for me certainly has it's Pros and Cons, a big Pro is when you're in a rush you can easily style your hair. Plaits, Pony tails and top knots are all quick effective hair cuts which aren't time consuming. However onto a Con is maintenance, I am still learning and testing different hair products out to find what suits my hair. 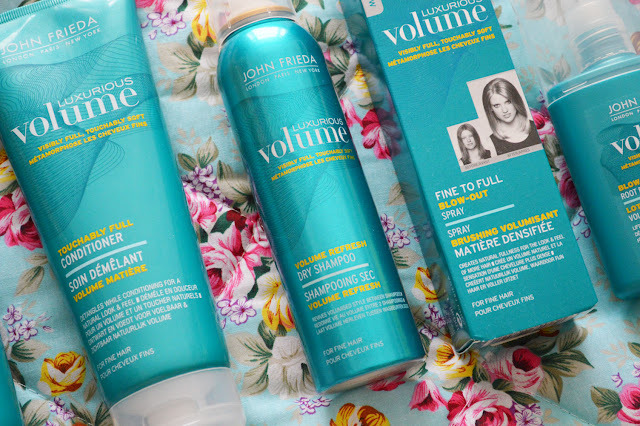 I was recently sent some of the new and improved John Frieda Luxurious Volume* range to try. I like the vibrant turquoise packaging, it's nice and bright and reminds me of Summer. 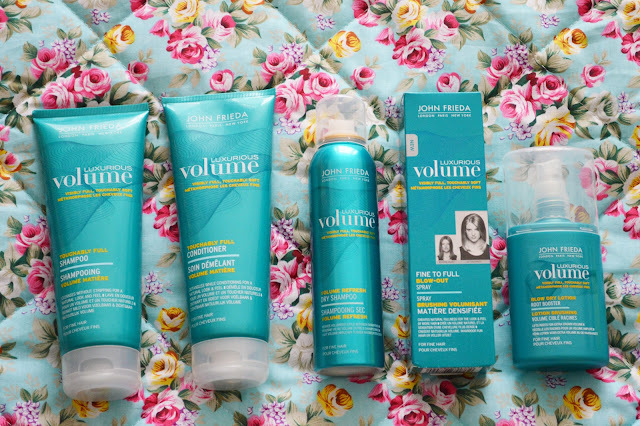 The Luxurious Volume range contains volume boosting properties paired with lightweight conditioning benefits, giving hair a full bodied finish that lasts. The Touchably Full shampoo and conditioner both smell fresh and feel lightweight in the hair. The shampoo lathers up well and is a breeze to use. No effort needed, I know that sounds silly but some shampoos are such an effort to massage through the hair that you end up using half a bottle just to feel like you've washed your hair. My hair felt refreshed and squeaky clean after using the shampoo without feeling weighed down. My hair is quite thick and because of the range being aimed towards finer hair I did have slight reservations it may feel thick or heavy in my hair but it had the opposite effect and felt very lightweight and helped add a little extra volume. So if you have thick hair don't dismiss the range. The conditioner is thick and creamy which I like and feel great once massaged into the ends. It rinsed out well and left my hair silky soft and tangle free. The next two products are both treatments working to add even more volume to the hair, the Fine to Full Blow-Out Spray could be comparable to sea salt/texturising sprays. Great if you have fine flat hair which lacks any volume, a few sprays of this from root to tip will add some volume as that of a blow-dry from a salon. Even with my thicker hair I still noticed volume in the mid-length sections. use a hair dryer to recreate even more volume which will last longer. The Blow-Dry Lotion Root Booster is used on towel dried hair right at the root for optimum crown lift, whereas the Blow-Out Spray is used to create volume all over. If you struggle to get lift right at the root which lasts you NEED this. Are you looking for a little va va voom for your hair? Could this be the range for you? Oooh I'm always looking to get more volume so this looks great. Thanks for the great review.